Smash all stones and blocks, pick up power ups that fall down and keep the ball in the field until all the bricks are destroyed. 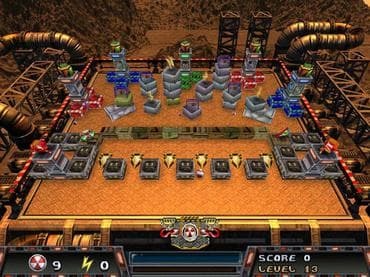 Feel like a great adventurer clearing up the nuclear world of traps, lasers, fire-balls, missiles and bomb together with game! Prepare to smash your way through a wild and crazy game, excellent 3D models and radiant level design. Move your bumper to the left and right to do this - that's it. The new bonuses are as dazzling to watch as they are helpful. So download free full version game today and start your quest! If you have questions about A-Ball game, please contact us using this form.